Oh No There Goes Tokyo, HO HO Godzilla! Nothing brings more joy to residents of Japan than venerating a radioactive monster that has repeatedly destroyed their cities, and terrorized them since 1954. 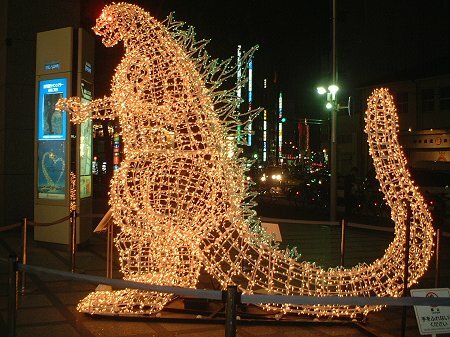 Since 2000, there have been sightings and photos of Christmassy Godzilla constructions. The above picture was taken in the Odaiba Aqua City shopping mall during the November 2000 Godzilla Festival. 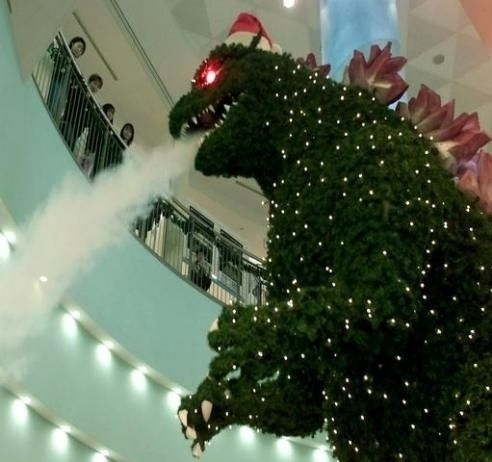 This is the usual photo that people come across while searching for the Godzilla Christmas Tree, but along my searchings I came across a few more jolly ol’ photos depicting the holiday spirit for destruction. This big guy was created and has been on display every so often during the yule tide in Takashimaya Times Square. This one, like its original predecessor, was set up right outside of Odaiba’s Aqua City mall in 2007. Looks like he’s really showing his joy for Christmas. Well there you have it. I wish the states would be a little more creative, but I don’t think we will be seeing the Rockefeller Center Godzilla Christmas Tree Lighting Special anytime soon. Bummer. This entry was posted on December 13, 2011 by David Joseph. It was filed under Strange Reports and was tagged with Christmas, Godzilla, Godzilla Christmas Tree, Japan, Tokyo.